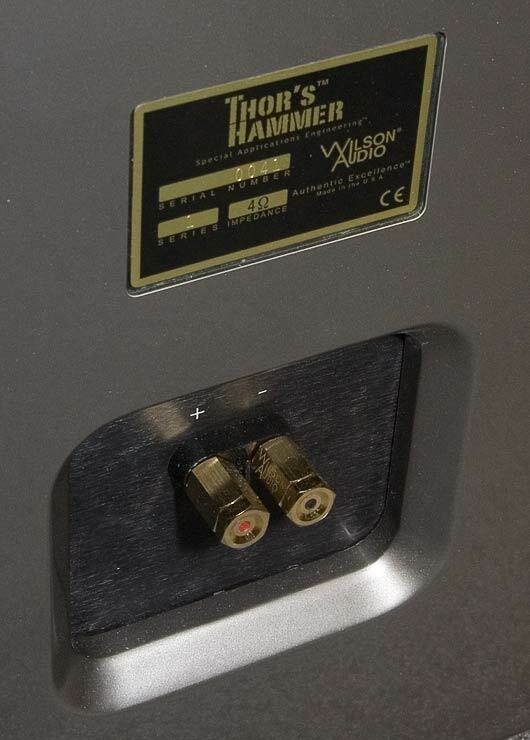 We snapped a few photos of the new Thor’s Hammer subwoofer before we saw the Alexandrias sitting nearby. This sub stands about, oh, 5 feet tall? These days I am more a fan of self-powered subs, and Wilson makes a great one of those too, along with Krell, Kharma, et. al. 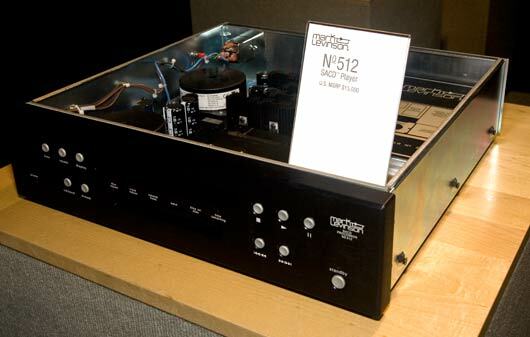 , but still, if you have a an extra solidstate amp sitting around that is not much good at music – they might be just fine at driving one of these. Great name for a subwoofer, don’t you think? Hmmmmm… lots of subwoofers have great names – Wamm, WHOW, WatchDog [hmm… maybe not so good], Depth Charge , EarthQuake, … – I wonder why it is that they seem so much easier to name than the main speakers? 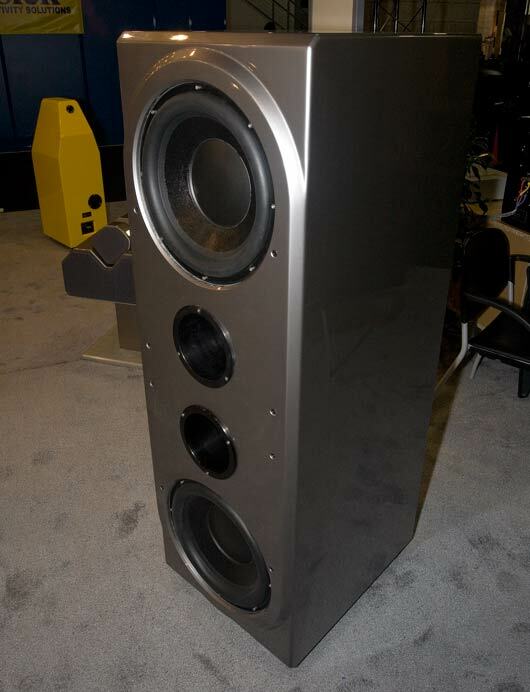 Having a hard time trying to think of ONE good name of a loudspeaker out there…. Well, the title of this post is kind of a misnomer, huh? 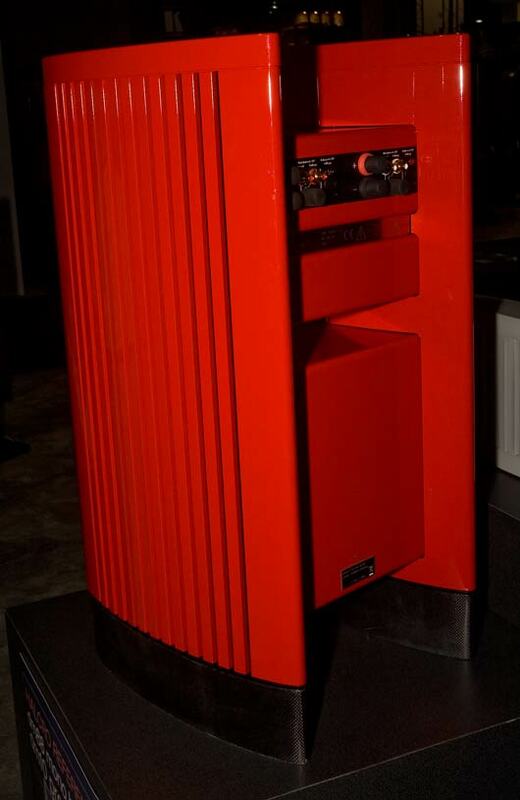 There IS no high-end audio at CEDIA – just the hope that someone might be able to buy some of this and that and string together a system that might be worth listening to. 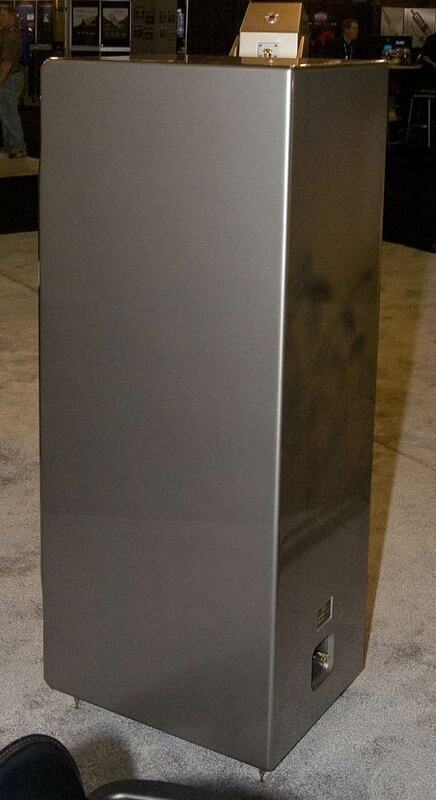 All of the photos below are in the main CEDIA show report in much larger [up to 9X] versions. Wilson announced the MAXX 3 [or is it MAXX III? or MAXX Series 3?]. It is looking a lot like the Alexandria, which they also brought and we include a photo of below for comparison purposes. The tweeter is now in a separate cabinet and is adjustable. Other changes? I do not know. The Wilson Alexandria X2. First time they were able to meet my camera, and, although finger-print-rich CEDIA attendees had a field day, so did my trigger finger. The new Martin Logan CLX. Part flat panel, part round panel. We heard it at T.H.E. Show driven by Ayre. 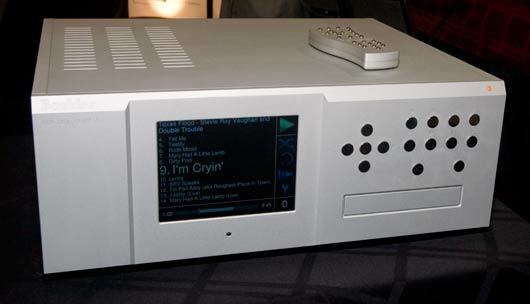 The new Boulder CD/SACD player – on static, albeit plugged in, display. Uses a memory-cache to take the transport out of the loop as much as possible. 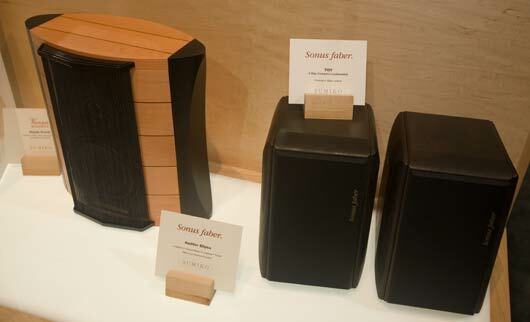 Sonus Faber now has desktop speakers. They come with real binding posts – so not really computer speakers – but excellent looking and the Electa Amatuer-looking ones on the right are wrapped in what feels like real leather [just like the front panel of the old Sonus Fabers]. 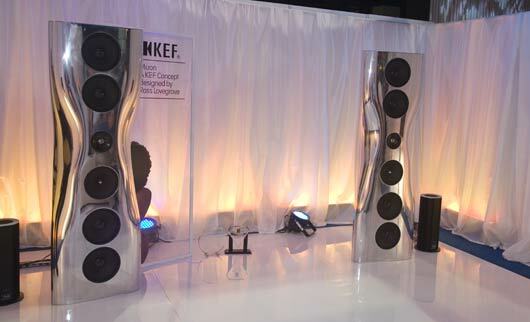 The big KEF speakers. Driven by Musical Fidelity and Neli says she say a DVD player source – and they sounded like it. I heard an evenness in both the freq response and dynamics – and so perhaps if they get passed an actual musical signal they might actually produce music – I’d like to hear that someday. Mark Levinson also has a new CD/SACD player. I think we should be seeing Blu-ray players, not more SACD players – but whatever. At $15K it had better be good – competition these days is fierce. That’s about it. Nordost and Acoustic Zen were there. PS Audio was there for the first time I think. We did not see Shunyata – in fact there were fewer booths this year, smaller booths, and fewer people. A sign of the economy, or the show getting bored with Denver? The T.H.E. Show only had 3 rooms – but steady traffic [it was actually better traffic than many exhibits on the main show floor were getting if they were not on the main arteries – and even some poor companies on the main arteries]. Neli thought we should have brought the little Audio Note system to TH.E. Show – a slam-dunk best of show for many people, and the others would hear something to think about for a long time. Oh well, shoulda woulda coulda. In any case, CEDIA will no longer be held in Denver – it is moving to Atlanta and the Indianapolis. About 95% of CEDIA is at CES each year – maybe I should ignore all the car sound and cell phone and computer sections of CES and spend my Main Conference hours only on static display audio and video next year. T.H.E. Show will again be held next door to CEDIA this year in Denver. 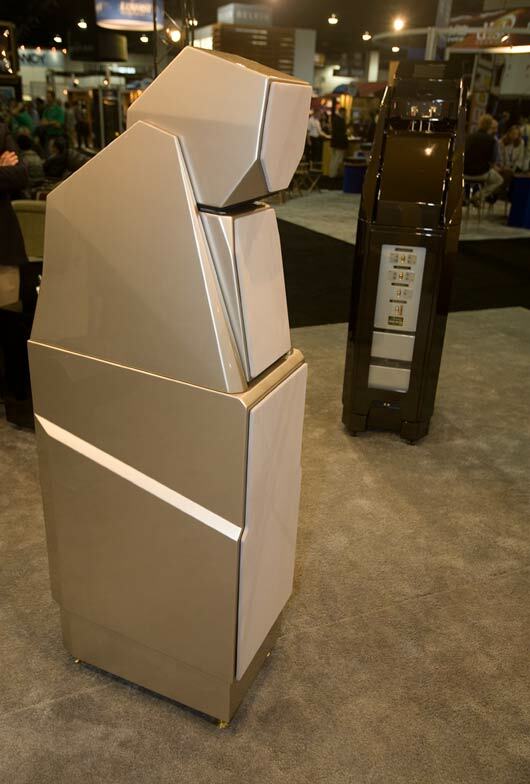 We will be taking photos and commenting about the sound in our CEDIA 2008 show report, the skeleton of which is now up on the site. CEDIA starts tomorrow, Thursday, though we usually hold off on visiting T.H.E. Show until Friday, to let everybody’s equipment over there warm up some.